There may be plenty of reasons you would have to kill a tree. You may use Roundup (or Glyphosate) to help you with this process. Roundup is actually a herbicide that is used by professionals and consumers. The product is readily available and has great results in achieving the ultimate goals. This product is extremely popular because of this. It works on trees, weeds and grass. Here is how you can kill a damaged tree. Read on for more information. Decide whether the tree that has to be eradicated will successfully be killed with Roundup. Re-evaluate whether the tree needs to be killed and factor in the removal. Look in your local Agriculture Extension Offices to research using herbicides to kill damaged trees. They might be able to educate you about the process and help with options to make the process easy to complete. There are three ways to apply the herbicide to the tree that needs to be done away with. The Roundup needs to be able to get to the growing, live, tissues of the tree. The chemical has to spread through the trunk of the tree in order to be effective. One of the ways is to use an axe to cut into the tree trunk. You can also drill holes into the base of the tree trunk and remove the bark from it. Follow the instructions in terms of how to accurately mix the herbicide. Measure with a measuring cup for accuracy. High concentrated herbicide will complete the job of killing live tissues. Dump the chemical into a spray tank and put in the instructed about of water. 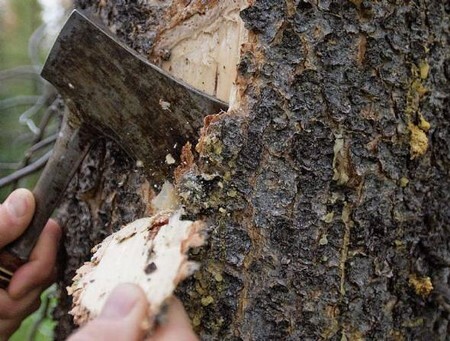 Use the axe to make more than one wedge cuts into the base of the tree. The chunks should be made in a downward fashion. This is so the chemical can be applied into the slot but help in by the shape of the wedge. From there it will soak into the tree. Drill several 3/4″ diameter holes around the trunk base at an angle. Last, remove a 1 ft wide chunk of bark. Apply the chemical to the holes and or edges. You can do more than one application of the herbicide by whatever method to make sire the herbicide was sufficient in doing the task. Safety is the most important thing. Always be careful when dealing with any chemical herbicide. Use eyes, hand, leg and arm protection against splash and splatter. Do not let the herbicide touch your skin.